Beijing Capital International Airport charges ahead of Tokyo-Haneda (68.9 million) and London Heathrow (72.3 million), UK’s busiest airport and third busiest in Europe overall. Europe’s busy airports list also consists of London’s Gatwick Airport as it continues to expand in various areas from parking options to possibly building a second runway in the near future. Although the double-digit growth in passenger traffic from previous years indicated that Beijing could close the gap on Atlanta, analysts were surprised to find out that Beijing only saw a 2.9 percent increase in 2014. Unfortunately, the title doesn’t result in anything really positive for Beijing considering that their airport has been deemed inefficient in terms of time-efficiency. In 2013, BCIA was named the world’s most delayed airport and up until today still maintains that reputation along with other airports across the mainland. In findings compiled by an American-based firm that studies air travel around the globe, it was discovered Chinese airlines and airports were the worst in time inconsistencies, with all the airports in question having less than 40 percent of their flights leaving on time. 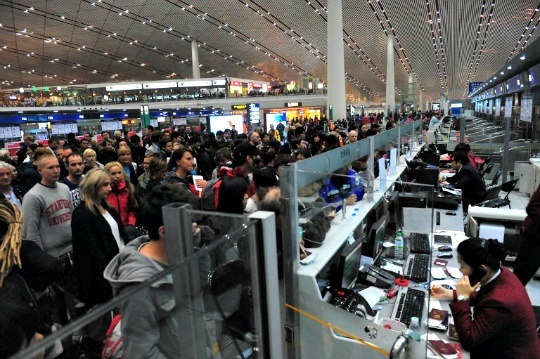 A big part of these delays is due to flights being centralised to the capital as well as the major cities like Hangzhou, Shanghai and Guangzhou, leading to long queues at check-in counters and immigrations. The Beijinger suggests that you might want to take the train if you’re travelling domestically to avoid huge crowds, crazy lines, and any airport anxiety. If you’re travelling internationally, make sure you leave for the airport early but don’t expect to board on time.